Three-day minimum rental required to obtain the best rate- 24-hour advance reservation is required - Renter must meet minimum age of 25 - Credit card is required - Taxes, fees, insurance and extras apply. Save up to 30% on 3 Day Special Only in Slow Season. Best rate guarantee! 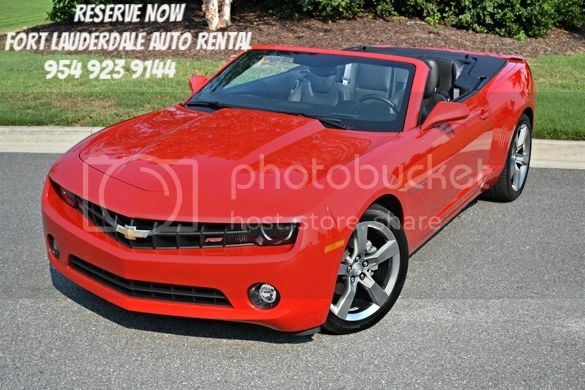 Don't pass up this offer, Rent a Camaro SS Convertible today! at the best rates, Fort Lauderdale Auto Rental has the latest model. Rent a Camaro SS at cheap rental rates in Fort Lauderdale Florida only at Fort Lauderdale Auto Rental. Daily, weekly, and monthly at fantastic cheap rental prices on Camaro SS . This partcular Camaro SS branded beast has a 6.2L LS3 V8 engine with 426 horsepower and 420 pound-feet of torque matted to a six- speed automatic transmission. The can get from 0-60 in 4.9 seconds, there's no denying how good it looks crusing through the bustling city or rolling down a deserted highway at dusk. With a fully automatic top there nothing better to be enjoying amazing weather in Florida. Fort Lauderdale Area - Fort Lauderdale Airport, Miami Beach - Miami International Airport - Florida Keys. Copyright © 2019 Fort Lauderdale Auto Rental. All rights reserved.